Ten at Oakland Hills North is a 186 yard par 3. Ahead of the 116th US Amateur Championship at Oakland Hills, I had the chance to play rounds on both the legendary South, and the just-as-good-but-less-notorious North. 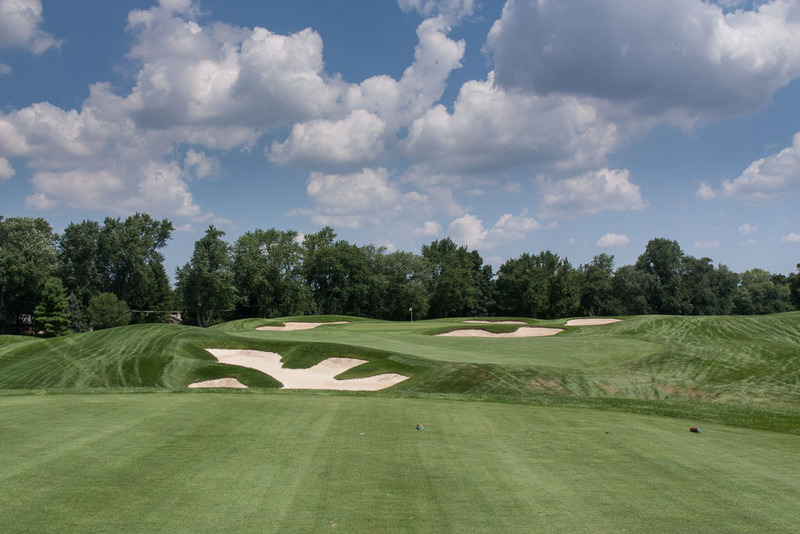 The US Amateur will be contested August 15 – 21 on both the North and South Courses at Oakland Hills Country Club in Bloomfield Hills, Michigan. Like the South, the North Course at Oakland Hills was designed by Donald Ross. The South opened in 1918; the North, in 1924. The USGA has set up the North Course for a course rating of 75.1 and a slope of 142. The South will play to a 77.5/146. The South course will play at 7, 334 yards with a par of 70, The North will be at 6, 849 and also a par of 70. The first at Oakland Hills North is a 349 yard par 4. A view of the green complex on the first at Oakland Hills North. The second at Oakland Hills North is a 405 yard par 4. A view from the fairway on Oakland Hills North's second. The fourth at Oakland Hills North is a 202 yard par 3. The fifth at Oakland Hills North is a 625 yard par 5. The sixth at Oakland Hills North is a 213 yard par 3. The seventh at Oakland Hills North is a 424 yard par 4. The eighth at Oakland Hills North is a 478 yard par 4. Oakland Hills North's ninth is a 461 yard par 4. Eleven at Oakland Hills North is a 467 yard par 4. The eleventh at Oakland Hills North from the fairway. The twelfth at Oakland hills is a 512 yard par 5. A view of the green at Oakland Hills' twelfth. The thirteenth at Oakland Hills North is a 169 yard par 3. The fourteenth at Oakland Hills North is a 419 yard par 4. The sixteenth at Oakland Hills North is a 373 yard par 4. A view from the fairway on the par 4 sixteenth at Oakland Hills North. The seventeenth at Oakland Hills North is a 464 yard par 4. The eighteenth at Oakland Hills North is a 394 yard par 4. A view of the greens complex at Oakland Hills North's eighteenth.